With new season openings, expanded hunting opportunities, and ever-improving technology, crossbow hunting is spreading across the country. Here’s what you need to know to get in the game NOW! Maybe you haven’t noticed, but crossbow hunting has become the hottest wave to hit the bowhunting world in many years. That’s not to imply that crossbow hunting is new. On the contrary, participation in crossbow hunting has been growing for the last couple of decades as more states open their hunting seasons to crossbows. What we mean is that in the last few years, exponentially more big-game hunters have taken up the crossbow as ever-improving technology and expanded hunting opportunities make crossbows a viable (and sometimes superior) hunting option. In fact, every state in the union, with the exception of Oregon, allows some form of crossbow hunting. So why should you get in on the crossbow hunting action this year? Let us provide a few reasons. Simply put, adding a crossbow to your hunting arsenal can greatly extend your hunting opportunities—from early fall to the season’s end. In many states, crossbows are legal for the duration of the traditional archery season. That means you can start hunting at the beginning of the season when the temperatures are milder, the deer are transitioning to their fall patterns, and there is less hunting pressure on pre-rut bucks. And speaking of the rut, in many states, the traditional firearms season opens well after the rut has begun. By hunting with a crossbow, you can maximize your chances of taking a large buck while the rut is on, but before gun season starts. This is the secret long-time bowhunters like to keep to themselves! If you’re a rifle hunter who has never taken up bowhunting but would like to hunt earlier in the season, crossbow hunting offers the ideal solution. Although there is a lot of crossover between rifle hunting and bowhunting (with many hunters using both guns and conventional bows, depending on what season is in), there are still many gun hunters who have never before picked up a bow and have no desire to do so. That’s not a slam on the gun-only crowd; it’s just that bowhunting takes a considerable investment both in equipment and in skill development to make efficient, ethical kills on big-game. Yet unlike conventional bows, crossbows do not require quite the same motor skill development and hours of practice. That’s not to say hunting with a crossbow is falling-off-a-log easy. On the contrary, good shooting form, a steady hand, correct trigger control, and proper follow through are as essential to shooting a crossbow as they are in shooting a conventional bow or long gun. Fortunately, if you already understand and practice these fundamental shooting principles, a crossbow will feel like a familiar friend from the moment you pick one up. So, what if you’re already a long-time bowhunter? What’s the incentive to get into the crossbow action? If you’re like most of us, you probably don’t have as much time to spend on the practice range as you used to. With crossbows, the distance between the box and the bullseye is ten to fifteen minutes. Once you’ve zeroed your crossbow, accurate shooting comes down to applying the basic shooting principles described earlier, learning to estimate yardage (unless you use a range finder), and learning the arrow drop of your particular setup. For those who have shot a vertical bow for some time, all of this will be second nature when you pick up a crossbow. Another crossbow advantage comes later in the season when the foliage is gone, the deer are skittish, and you have to dress like an Eskimo. Bowhunting, whether on the ground or in a treestand, can be extremely challenging during the late-season. That is why the vast majority of bowhunters call it quits once gun season rolls around. It’s too cold, the deer are more difficult to get into bow range, and drawing a bow while dressed like a puffalump is beyond annoying. There’s no need to stay home just because gun season is over and temperatures have plummeted. 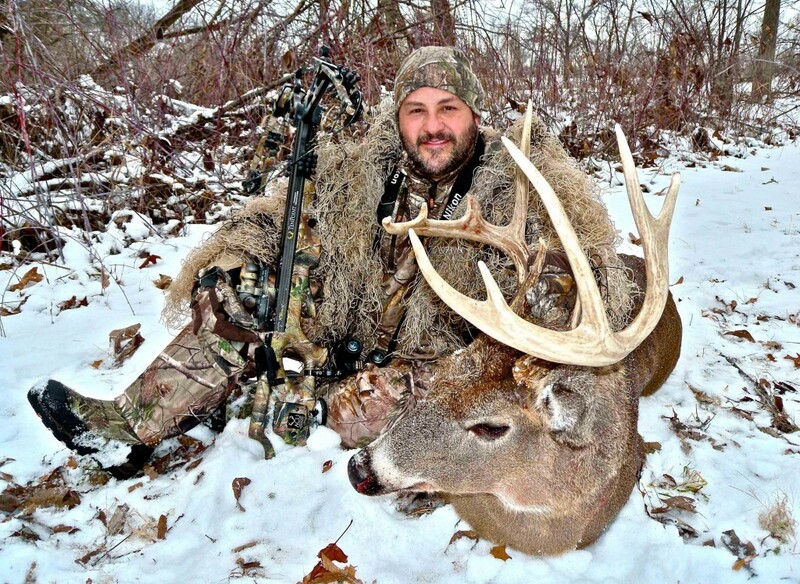 Crossbow hunting in the late-season can be significantly more productive and less challenging than hunting with a conventional bow. Crossbow hunting minimizes these problems. You can easily maneuver a crossbow while wearing heavy clothing, and even though the woods are open now that the foliage has dropped, skittish deer and longer distances aren’t a big issue. Most hunters find that they can typically shoot farther and more accurately with a crossbow than a conventional bow. Also, large body movements aren’t required with a crossbow like they are with a conventional bow, so deer are less likely to see you when it’s time to take the shot. Finally, crossbows are the ideal solution for those who would like to hunt deer earlier in the year but are unable to shoot a vertical bow due to physical limitations. Shoulder and back problems are especially notorious for knocking bowhunters out of their favorite season. Fortunately, nearly every state except Oregon allows crossbow hunting for those who are physically unable to shoot a conventional bow. Crossbows require little physical effort to shoot beyond cocking the string, and even that is no problem thanks to the various cocking devices on the market. Like any kind of hunting, crossbow regulations vary from state to state. Some states, for example, allow hunters to use either crossbows or conventional bows during their archery season with no limitations. Other states have established special seasons for crossbow hunting that run concurrent with or in addition to their regular archery season. Still other states permit crossbow hunting only for those over a certain age or who have a certified physical impairment that prevents them from shooting a conventional bow. For a quick crossbow status overview by U.S. states and Canadian provinces, TenPoint has created an at-a-glance map and legend complete with links to each state or provincial governing body so you can get the most accurate, up-to-date information available. Be sure to check it out before you start your crossbow hunting adventures. Crossbows are nothing new, having been around for at least 2,500 years, and the basic principles of the weapon are the same as they have always been—a short-stroke bow mounted perpendicularly to a shoulder stock. What is new, of course, is the technological advancement of the modern crossbow compared to its progenitors. Today’s crossbows are more mechanically efficient, more powerful, more accurate, and easier to use than they were even a decade ago. Crossbows have undergone significant improvements in material construction and design in the last several years. Crossbows come in three configurations based on the bow design. There is the recurve, conventional compound, and the reverse compound. The most popular, by far, is the conventional compound crossbow, so that is what we’ll focus on here. The biggest question first-time crossbow owners have is performance; specifically, what is the maximum lethal distance of a crossbow? Most crossbows have a maximum lethal effective range of up to 60 yards. They will certainly shoot farther than that, but once you go beyond 40-45 yards, velocity and kinetic energy begin to drop off, making kill shots beyond 50-60 yards questionable and ethically inadvisable as arrow penetration, wind drift, and “string jumping” of the target animal become factors. Yet when you consider that most whitetails are taken at under 20 yards, with 30-40 yards being the maximum distance in most fall whitetail environments, the crossbow is a lethal weapon for all deer hunting situations. In truth, crossbow lethality within 50-60 yards really comes down to the shooter’s capabilities. There are almost as many variations of the compound crossbow today as there are conventional vertical compounds, which can make it difficult for a new crossbow hunter to select a model. 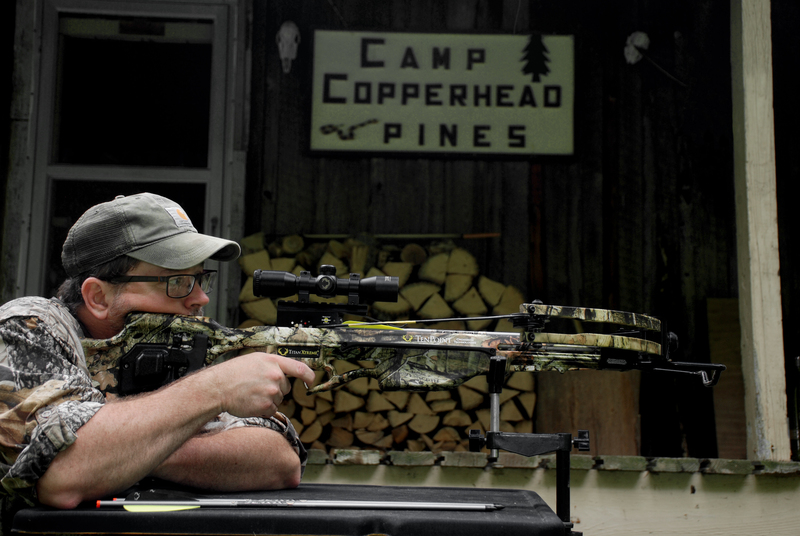 As with conventional compound bows, crossbow performance comes down to draw weight, power stroke, and limb/cam design. These three variables deliver what really matters for lethal hunting performance: arrow speed and kinetic energy. Arrow weight affects speed and energy. Lighter arrows shoot faster but lose more energy (a factor in penetration) than heavier arrows. Heavier arrows shoot slower but retain more energy for downrange penetration. The happy medium is often somewhere in the middle. Fortunately, most manufacturers rate their crossbows according to the speed and energy they deliver with a specific-weight arrow. As a rule, any crossbow that shoots in excess of 275 FPS at 80 FP KE is optimal for large-game hunting. Thus, selecting a crossbow is not so difficult after all. Find one with at least the minimal performance stated above, that fits you comfortably when shouldered, and exhibits a good balance in the hand. From there, it’s a matter of choosing available options and arrows that best suit your hunting style. 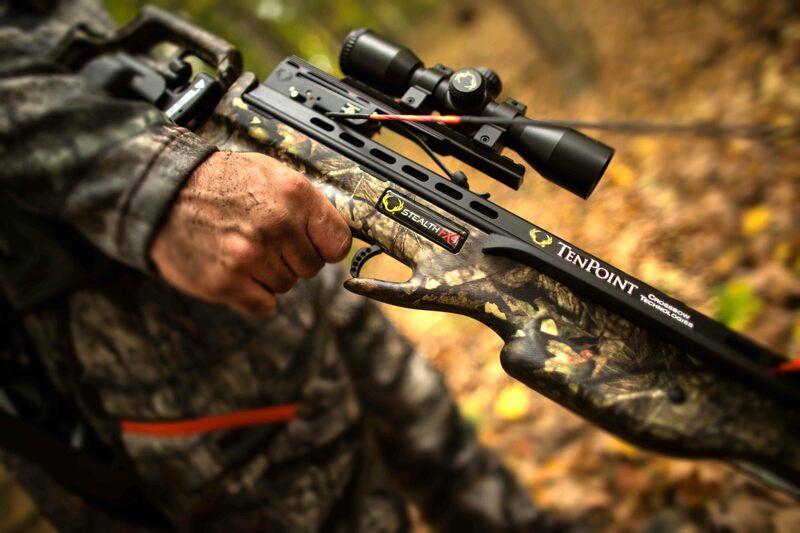 The TenPoint Titan Xtreme makes getting into crossbow hunting easy and budget-friendly. With a retail price beginning at $599, the Titan Xtreme comes with everything you need to get into the crossbow game. 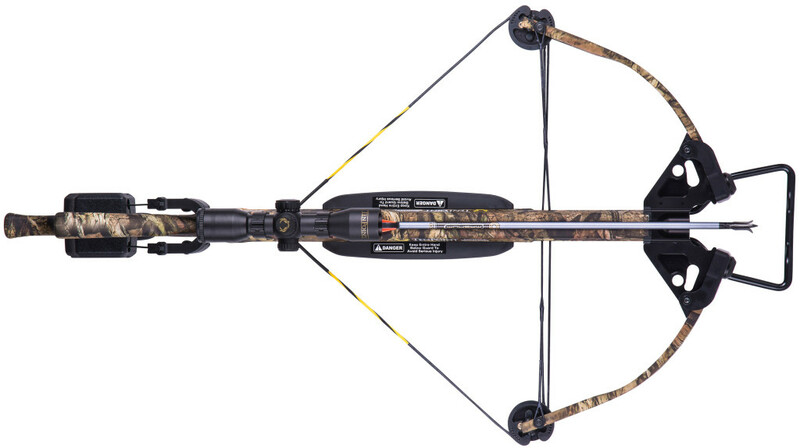 One model we recommend new crossbow hunters consider is TenPoint’s Titan Xtreme. 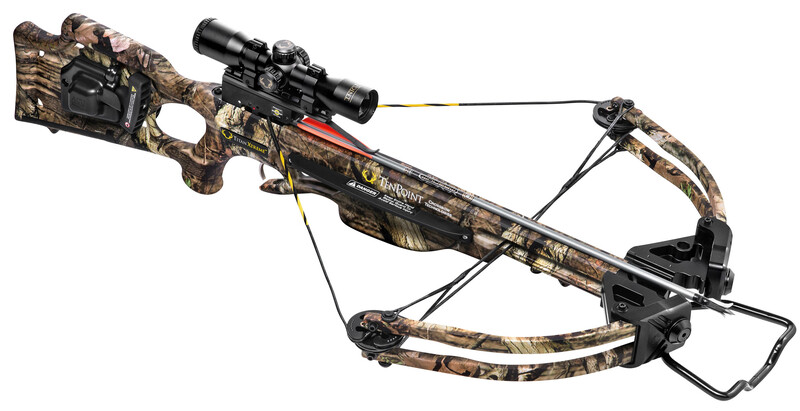 With a budget-conscious price point, the Titan Xtreme shares many of the features and performance capabilities of TenPoint’s premium-level crossbows, such as the Dry-Fire-Inhibitor (prevents dry-firing when no arrow is on the flight deck), ergonomic stock and barrel configuration, integrated safety wings (protects the shooter’s foregrip hand and reduces vibration noise), and a nickel-Teflon coated trigger assembly for smooth operation and corrosion-resistance. In all, our testing shows the Titan Xtreme to be a well-balanced, accurate, workhorse of a hunting crossbow that won’t break your budget. 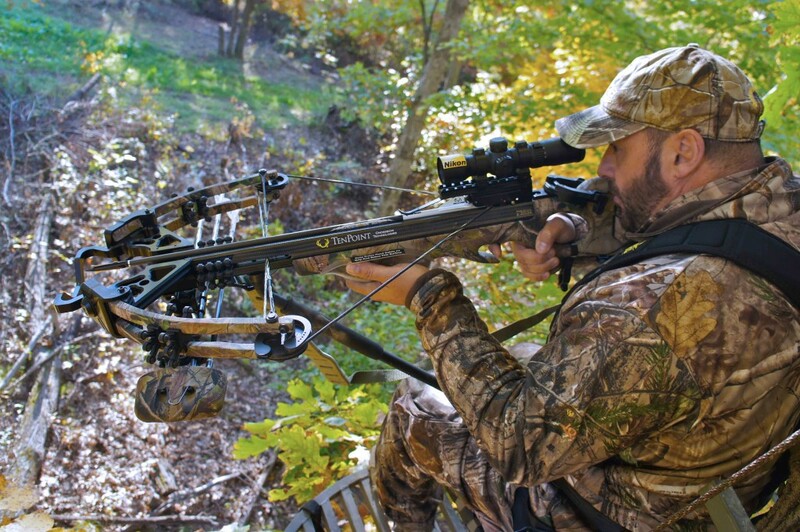 Like all TenPoint crossbows, the Titan Xtreme is sold as a complete package. A 3x Pro-View 2 three-reticle scope (for 20, 30, and 40 yards) comes pre- installed and bore-sighted at the factory, so it takes only minutes to zero. Also included are three arrows with field points and pre-fitted Omni-Nocks for precise string alignment, plus an Instant-Detach three-arrow quiver. Setting up a crossbow like the TenPoint Titan Xtreme is a simple process. You can literally buy this crossbow on your way to camp, assemble it, sight it in, and be in your stand for the afternoon hunt. TenPoint offers three cocking options for the Titan Xtreme, and which you choose will have a bearing on the final cost. Thanks to its 21.6-inch axle-to-axle width, the Titan Xtreme can be cocked by hand without a cocking device. If you would rather have cocking assistance, you can choose between the ACUdraw or the ACUdraw 50 cocking mechanisms. Both mechanisms come installed at the factory, or you can upgrade to one later, if you wish. The ACUdraw uses a hand-crank to reduce the cocking effort to around five pounds. The ACUdraw 50 has a retractable hook-and-rope system that reduces the cocking effort by 50 percent. We like this system best because of its cocking speed and ease. We recently tested the Titan Xtreme with the ACUdraw 50 system at our deer camp, wanting to see just how long it would take to unpack, assemble, and sight in the crossbow in a real-world hunting camp environment. From the time we opened the box to the time we were shooting nickel-sized groups was about 20 minutes. Check out the video to see how easy it was. Picking up the crossbow doesn’t mean giving up hunting with your conventional bow or your gun. It means that you now have an opportunity to spend more time in the field hunting and putting more meat in the freezer, whether that is earlier in the archery season or well after the rut and gun season have passed. If you’ve given up bowhunting because of physical challenges, the crossbow is your chance to get back in the game we all love so much. So, check your state regulations regarding crossbows, and see for yourself why more and more hunters are taking up the crossbow challenge.